Join a pair of young newlyweds as they descend deep into a mysterious forest, encountering unknown creatures and unimaginable landscapes. Amongst the unusual flora and fauna, they discover within themselves something more strange and terrible than any sight their safari has to offer. 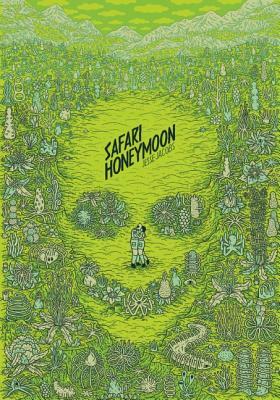 Safari Honeymoon is a tale of jungle love and jungle madness. Jesse Jacobs was born in Moncton, New Brunswick, and now draws comics and things from his home in London, Ontario. He has worked on the Cartoon Network show Adventure Time and has appeared in the 2012 and 2013 editions of Best American Comics. Jesse Jacobs was born in Moncton, New Brunswick, and now draws comics and things from his home in London, Ontario. In 2009, his books Small Victories and Blue Winter were short listed at the Doug Wright Awards for Canadian Cartooning. He received the Gene Day Award for best Canadian Comic Book Self-Publisher of 2008. Even the Giants (AdHouse, 2011) marked his major publishing debut after several award-winning, self-published titles. He has worked on the Cartoon Network show Adventure Time, and his work has appeared in the acclaimed Latvian comics anthology s!, as well as the 2012 and 2013 editions of Best American Comics published by Houghton Mifflin Harcourt.